The IMR is a 4 round burst fire assault rifle in Call of Duty Advanced Warfare. It has the highest damage in the class. There is no minimum delay between the burst, the gun can essentially be fired like an automatic if you time pulling the trigger correctly. Overall the IMR is a versatile weapon that can be employed to do whatever you want. The IMR is a good all around weapon so choose attachments that make it easier to use. The Red Dot Sight makes it easier to see enemies, especially when they are further away. The Foregrip reduces the recoil making you more competitive at medium and long range. To ensure you can’t be spotted by UAVs and other radar pings use Low Profile. Blind Eye will keep you safe from enemy air support. Toughness redcues flinching making it easier to win a contested firefight. The Blas Suppressor stops you from showing up on the mini map whenever you double jump. To get back into the action faster use the Exo Overload ability which gives you a speed boost while active. Use your favorite grenade as the Exo Launcher, such as the frag. 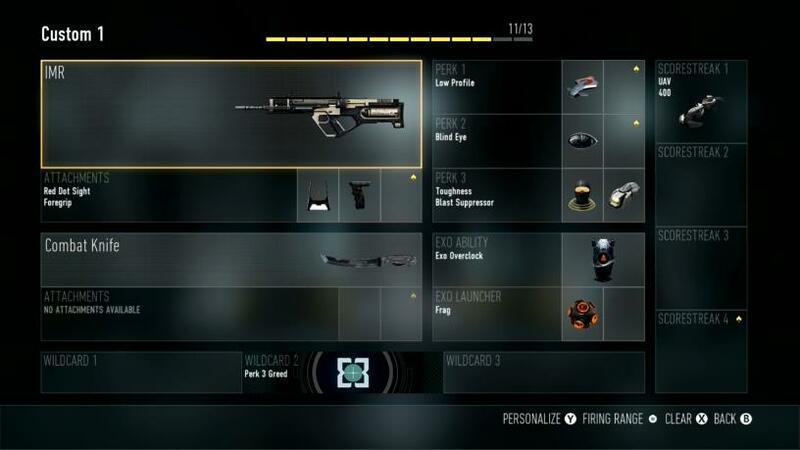 Here is the recommended loadout for the IMR. It has 3 points left with which you can choose your favorite scorestreak. This entry was posted in Call of Duty Advanced Warfare and tagged Advanced Warfare, Assault Rifle Guides IMR, Best Attachments, Best Perks, Call of Duty, Call of Duty Advanced Warfare, IMR, IMR best Attachments, IMR Best Class Setup, IMR Best Loadout, IMR Best Perks. Bookmark the permalink.